"Big" made Penny Marshall the first female director of a feature that grossed over $100 million. Twelve year-old Josh Baskin (DAVID MOSCOW) is too small to ride the 'grown-up' rides at the Carnival. He has no chance of impressing Cynthia Benson, the girl of his dreams. In a wonderfully magical and atmospheric sequence, Josh tries his luck at a carnival amusement machine called 'Zoltar' - a Devilish looking Genie in a booth. Josh freezes. This thing isn't even plugged in! The following morning he leaves his bunkbed with a thud. He has awoken as a fully grown Josh Baskin (TOM HANKS). He is unable to prove to his frightened mother (MERCEDES RUEHL) that he is truly her son, and she assumes that the adult before her has kidnapped Josh. Only best-friend Billy Kopeche (JARED RUSHTON) will help him. The two flee to New York and find Josh a place to stay in a crummy hotel. Their plan is to find the Zoltar machine and make another wish to return him to his youthful form. The pair discover that this will take six weeks, and to occupy his time, Josh lands a job at Macmillan Toys, a huge Toy Company! With the inspired mind of a child in a Toy Factory, Josh becomes the Macmillan wunderkind. His wide-eyed honesty is exactly the push the company needs. Even MacMillan himself (ROBERT LOGGIA) is impressed. 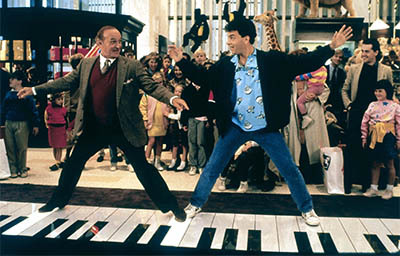 Of course, how could we forget one of the most memorable scenes of 80's cinema, as the two men dance together on the giant light-up piano at FAO Schwarz in Manhattan. It is also at MacMillan Toys where Josh meets Susan (ELIZABETH PERKINS of "About Last Night") with whom he falls in love. Again his childhood innocence and naivety works in his favour as Susan can only be dazzled by his uncomplicated and romantic approach. Soon Josh obtains the location of the nearest Zoltar machine, he is torn between the life he misses as a boy, and the woman he loves as a man. Josh has to decide if he should visit the machine and make his second wish. "Big was one of a fleet of 'bodyswap' movies that were a fad in the late 80's. Other examples are "Vice Versa" and "18 Again". The film is handled with grace, humour and sensitivity by Marshall who perfectly executes all of the bittersweet paradoxes of Josh's dilemma Aided by outstanding performances from both the child actors and their adult contemporaries, the film waltzes beautifully though charming scenes of Josh's naivety and his desire to return to his family vs. his growing love for Susan. Other less obvious gems are: The solution to the computer game he solves as an adult that he could not see as a child, and his final realisation that he has lost touch with the honesty of youth as he tries to market an overpriced comic book to kids just like himself. Other mention must go to John Heard as Susan's sarcastic ex-boyfriend. Surely one of the finest supporting actors in recent years. 'Big' is an absolute joy, a real package of a movie. It's the reason you love cinema. Great script acted by fantastic actors. Warm, touching and funny. No weaknesses that spring to mind.